Post your decks and tips for Gideon below! Play it right and you could put down almost anyone, not very fast though. This is one very basic deck I've been toying around, with good ratios and pretty "cheap" to build (mainly commons and uncommons). This is not an endgame deck, full of rares and mythicals. It's a starter deck with (usually) easy to get cards. Most of the cards can be popped in 1-2 turns if you get 3-white combinations, the only cards with 10+ cost are the Oracle (11), the Vanguard (14) and a fully awakened Ondu (12). The idea is to simply drop a big enough healer so that you can overheal all damage done every turn, while keeping enemy threats at bay until you place your pieces together. Once you get an Oracle and a steward, start looking actively for Call to Arms planeswalker power, unless you need to drop something. War Oracle. UNCOMMON. Your main damage dealer and healer. You want to pop her first if possible, so she takes first slot. Serene Steward. UNCOMMON. Not only she's brutal by herself (4/4 for 6), but also comboes great with the Oracle, specially if you popped the Oracle first (+1/+1 for 2 mana every turn on your first creature). Sometimes you can drop her straight at turn 1. Unless you have an Oracle on your hand, do it. Munda's Vanguard. RARE. If you can get her down, it's a nice addition because her activate 2 (+1/+1 to all your units) skill. Supression Bonds. RARE, but basic white board control card. Disables first unit from your oponent, limiting his board to 2. A shame it has only 1 shield. Grasp of the Hieromancer. COMMON. Multipurpose card. Further buffs your first creature, disables any pesky defender unit and nets you yet another target for reckoning. Encircling Fissure. UNCOMMON. Main board control. For 5-8 mana you get a full turn without enemy creature damage. For 9 mana you get the same plus a 2/2 elemental with haste. Keep this charged and disabled until the need arises. Alchemist's Vial. COMMON. Secondary Board control, also a cantrip. Smite the Monstuous. COMMON. Basic board clear if you cannot pop reckoning. Swift Reckoning UNCOMMON. Secondary board clear. Be either bonds, Fissure or Vial, this card permanently deals with the issue. Just finished maxing Gideon Battle Forged, using a reknown deck. War Oracle goes out first, if i can get her out first and then Relic Seeker , it is usually fairy over by that point if Call To Arms is ready. Once they get going, you start healing, i have had that little Oracle up to 40/40 , no matter what gets dished out, you will just heal it back up. Takes a bit of luck to get started, need to draw Oracle and Relic, but it seems to happen regularly enough to make it viable to win in a few tries. 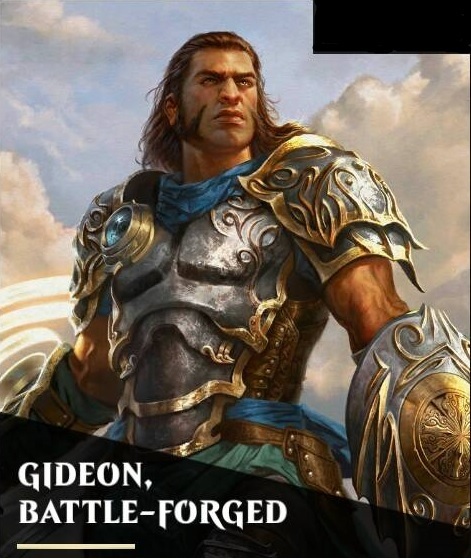 Have Gideon Battle Forged maxed out at level 60. It took me a while to figure out this deck, but now that I have and end game build for it, I absolutely love it. Total powerhouse Deck build if you can get the cards. Archangel of Tithes (Mythic) - Mana Cost 18 - 7/9 Angel with flying. Every time a creature attacks you, you gain two mana for each creature. Really like this card for the effiecient mana cost for what it is, and for the major mana battery effect. Who doesn't love a big beast mana battery that flies? Emeria Shepherd (Mythic) - Mana cost 11 - 4/4 Angel with flying. Every time you landfall white, a creature that has died comes back on the board. Every time you landfall, a creature that has been killed goes back in your hand. Very effiecient mana cost for a 4/4 with flying. Not to mention the revive effects. Linvala the Preserver ( Mythic ) - Mana cost 17 - 8/8 Angel with flying and Regen 4. Gain 10 life when this enters the battlefield. If your opponent controls 3 creatures, summon 2 4/4 angels along with Linvala. Again, very efficient mana cost for a very nice high end beast, with a pair of huge bonuses. Suppression Bonds - mana cost 6. First creature your opponent controls is stunned. Very low mana cost for this effect. The one draw back is that this support only comes with one shield. So you need to protect it, or reinforce it. I like this card for the effect, and because it pairs quite nicely with a support heavy deck. It also pairs with the spell swift reckoning. Shrine of the Forsaken Gods - Mana cost 5 - Very low cost automatic mana battery. I love this card, and use it in almost all of my decks, even when I don't have a colorless heavy roster. I prefer it over the other option for white, which is the various dual land supports. Mirrorpool (rare) - Mana cost 4 - Another card that I love, and will use in most of my decks. Very efficient, and sneaky reinforce. Pairs quite nice with the already big Linvala, and Archangel. 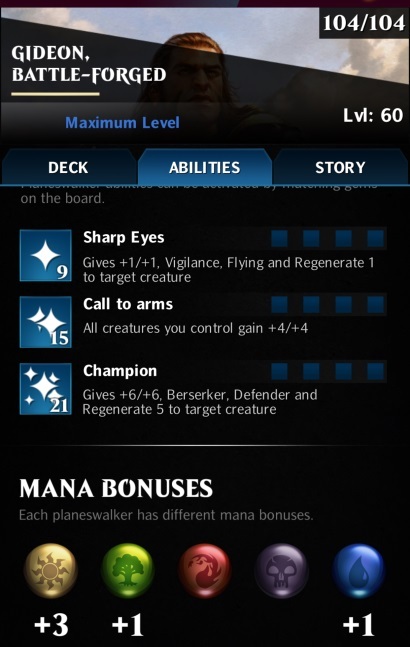 When paired, it creates a 14+ damage super angel, and mana cost of total at most 22 mana. Very efficient card. Hixus, Prison Warden (Mythic) - mana cost of 6 - Every creature that hits your plainwalker is permanently stunned while this support is in play. Fantastic lockdown stun card. Like suppression bonds, the drawback is that it only comes with one shield on it, so it needs to be supported, or protected. Sigil of the Empty Throne (Gold) - Mana cost of 14 - When this support is out, every time you play a support card, you summon a 4/4 angel token with flying. While the mana cost on this card is quite high, I have found this card to be immensely useful for this deck. It is a large part of the reason for having 5 total supports, with the other 4 all being low costing. The pair allows you to summon very powerful angels, whenever you play one of the above cheap support cards. Really works well with this build. Just played a game where this triggered 9 times. I got none of my beasts to draw, however, ended up winning the game with a token angel with power of 40+ with buffs by the end!!! Swift Reckoning (uncommon) - mana cost of 6 - Another DD instant kill spell. Pairs very nicely with Suppression Bonds, and Hixus, to give a cheap instant kill. Pair all of the above with Gideon's power up abilities, which are a variety of individual, and aoe buffs, and what do you get? A powerhouse stun lock angel deck that will win you most matches. Emeria is really really situational, and even if you get lucky her effect isn't that impressive. First you need to lose another creature or support, and you need to have her out, and you need to be able to get a white landfall (returning a creature to your hand is nearly useless in a white deck, card draw is awful and its implementation is kind of a fundamental flaw with how this game tries to emulate MTG, but oh well) and for doing all that you get maybe a single card for free. Not worth it when you can get just a creature twice as big out for the same cost. Only use I can think she'd ever have is in some sort of green landfall deck to bring the supports those landfalls destroyed back in to your hand so you can use more fertile thickets or something. For Gideon, she's useless until maybe if Knight of the White Orchid gets buffed to be playable and then you could maybe run a weird white landfall deck if you have Oblivion Sower or something? The aim isn't actually to recur your creatures. They're nice and have on-summon effects but you really want them to stay on the board and not go anywhere else. The aim is to recur Mirrorpool. You basically want your Mirrorpool to fire for every single summon you do. If you can fire it off for every single spell you cast too then go you. This is much easier to do with Starfield of Nyx, which doesn't take up a limited creature slot and can provide you with +15/+15 stats, though it is a bit pricier. Before the addition of smite and scour I had been running more supports, blessed spirits as a secondary theme. Looking for help to start from scratch for the current nodes of power event. I played once with this Gideon so I am tied to him for this go around at least. Maybe I will win enough crystals to get the other Gideon or Ajani. Right, I agree with you. But Emeria Shepherd has the upside of bringing back your creatures which have pretty nice on-summon effects. And it isn't that costly so providing you with the recursion ability and a 4/4 creature at the same time is nice. Starfield of Nyx may not take up a creature slot but it usually compels you to fit in at least five supports including itself for any consistency in hitting the +5/+5 bonus. If Mirrorpool is on the list you probably need to add another support, which leaves you with few slots for creatures and spells anyway. Luckily Oath of Gideon is so strong! And I would want to run Shrine of the Forsaken Gods anyway to make up for Gideon's low mana gains. I just wish I had Sigil of the Empty Throne to make the deck viable. So we're talking the following five supports? Well yes that combination would give you an 8/8 Angel every turn at the trade-off of a very expensive setup. Thopter Spy Network on roids basically. In any case I don't have 3 of the 5 cards listed above but I agree it will be strong once set up and as long as Starfield doesn't get demolished. I'm not that big a fan of Oath of Gideon by itself. White does have a lot of good and efficiently costed creatures with nice abilities. Serene Steward is 1 mana more for an ability to greatly boost your first creature over the course of the match. Lantern Scout gives Life Link to all. War Oracle, Consul's Lieutenant and Iroas's Champion are all established to be great creatures for Gideon with good abilities or traits. Different deck building style perhaps. Been having fun with the reward from the Terrors in the Shadows PVP Event, Thalia's Lieutenant. Tactic is to use Serene Steward + Lifelink to boost creatures whilst waiting for Thalia's Lieutenant to show up. Swap out Iroas's Champion for Lantern Scout if you have it for further consistency and to lower the mana average. Hoping to get some advice/help for my Gideon OG deck...Right now, for obvious reasons, it's extremely slow and even then, a bit situational. Basically, I think I was trying to make a lifegain pump deck without a Lantern Scout (still don't have), and it's just gotten...well, messy. Aside from somehow trying to save this deck, my two thoughts are to either turn this into an Angel deck or a Human deck, to take advantage of some of the new SoI cards I've picked up. Sigh...still very "meh" on all three of these options. Any thoughts/help would be appreciated. I'm not much for theme decks but if you want something that doesn't lose much (I haven't lost since I made it and I'm on a 33 game winstreak) and has no rares of mythics, this is it. It could easily be upgraded with better creatures if you have them. Creature-wise, let's state the obvious, Runaway Carriage + Sharp Eyes wins games on its own. For those times when you don't get it in your opening hand so you need some cheap creatures for Call to Arms. You want it to always hit at least two guys which is the reason for Kitesail Scout and Thraben Inspector. Both of those have upsides even if they are cheap, one has evasion, the other draws a card; pretty decent for 4 and 5 mana. Reflector Mage shouldn't need explanation but it's another way to get rid of Reach creatures. Aven and Consul are just the best options I have right now although both are pretty solid and become really good with Call to Arms. The spells are simple, kill, kill and get out of my way. As for Silverstrike, it kills Runaway Carriage. Sure it kills other stuff too, but it's inclusion is to kill Carriage. Comments and critisism are welcome. 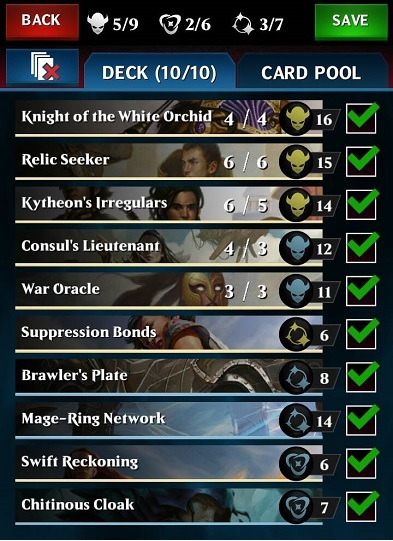 Hi all, I'm having decent success with this deck in QB. I'm at 70.6% win rate since I started playing and mostly been playing Gideon. I'm wondering what I can do to improve it. I try to get Consul's Lieutenant or Knight out and buff as soon as possible with Gideon's first ability then back up with War Oracle for a basic strategy. Any help is much appreciated and thanks in advance! Relic Seeker is great for boosting your first creature cause it gives +1/+1 every turn once it's renowned. If you want a big defender then it is one of the more consistent ways to boost your first creature. However it'll have to replace Knight of the White Orchid due to the cost so it depends whether the white gem conversion from the Knight are consistently giving you free matches or not. But what it helps do is consolidate the boosts into your first creature. In any case you have Consul's Lieutenant and Runaway Carriage as defender picks already. Smite the Monstrous is a better card for hard removal than Scour from Existence. There are rare few cases where you need to destroy a creature 3 power or less. You can also try replacing Knightly Valor with Drownyard Temple if you find that you are short on mana.